PopCap has denied a Wall Street Journal report that Bejeweled 2 for the iPhone violates user privacy, calling it "misleading and confusing." The Wall Street Journal published a report last week claiming that many of the most popular apps on the iPhone and Android, including hit games like Angry Birds and Bejeweled 2, broadcast private user information like user name and password, location and mobile number to the app maker or, in many cases, third-party advertisers. Rovio, the studio behind Angry Birds, quickly denied the charge and now casual game behemoth PopCap has joined suit. "Recent reports on user data and transmissions to third parties for a variety of iPhone applications have been misleading and possibly confusing for PopCap customers," PopCap's Head of Studios Ed Allard told Develop. He explained that the game transmits user name and password only after owners link the game to their Facebook account, and mobile number only if users set up their Facebook account to authenticate with it. "The transmission of user name, password and phone number is optional and occurs only after explicit player input through a Facebook login dialog box for Blitz mode," Allard said. 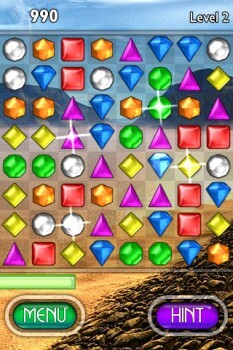 "After logging in to Facebook, players can interact with their Facebook account through Bejeweled 2 on their iPhone." Concerns over privacy on Facebook have been kicking around for years and flared up most recently in October, when the Wall Street Journal revealed that several popular apps, including games like FarmVille, FrontierVille and Texas Hold 'Em Poker were transmitting identifiable user information to online advertisers and data trackers.